New South Wales: Bermagui - Awareness Event, May 10th. The Days Roundup: On the South Coast of New South Wales, in the small community of Bermagui, a great night for Lyme awareness was had. From Jacqui: "51 people in Bermagui watched Under Our Skin tonight. Unbelievable response from the audience who were wonderfully supportive. Sadly many heads were nodding in recognition of those symptoms and our story. And I met many more silently suffering Lymies tonight. Much more wide spread down here than I would have thought. Our awareness events are working and we will help more people. Go Lyme warriors!" 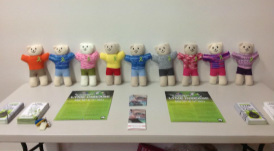 The "Awareness Table", complete with Lyme Bears that Loris Manns kindly makes and donates to children with Lyme. 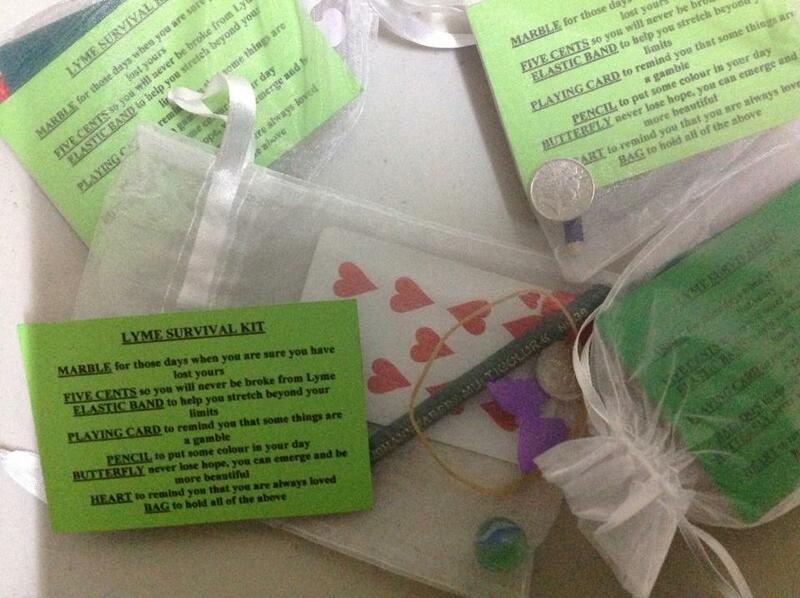 A big thank you also goes out to Loris Manns who also helped with the preparations, and made "Lyme Survival Kits" for the evening. The short story of young Sophie, a local girl affected since birth with Lyme disease was also shown on the night. The Hall and Chairs at the Ready !! Bermagui event will be a public screening of Under Our Skin documentary on Lyme disease. The movie screening will be followed by light refreshments provided and served by the local CWA chapter ladies. Brochures about Lyme disease will be available for attendees. Copies of the Under our Skin DVD will be available for purchase. Did you know that Lyme disease cases have been reported in every state in the country? And that the disease is often misdiagnosed as other illnesses such as fibromyalgia, chronic fatigue syndrome, or multiple sclerosis? And an increasing number of cases of Lyme disease are being reported locally? Make sure you know about Lyme disease. Join us for a screening of the award-winning documentary, UNDER OUR SKIN, which exposes the hidden story of Lyme disease, one of the most serious and controversial epidemics of our time.